Magazines, books, specials, and more went for as low as P30 each. 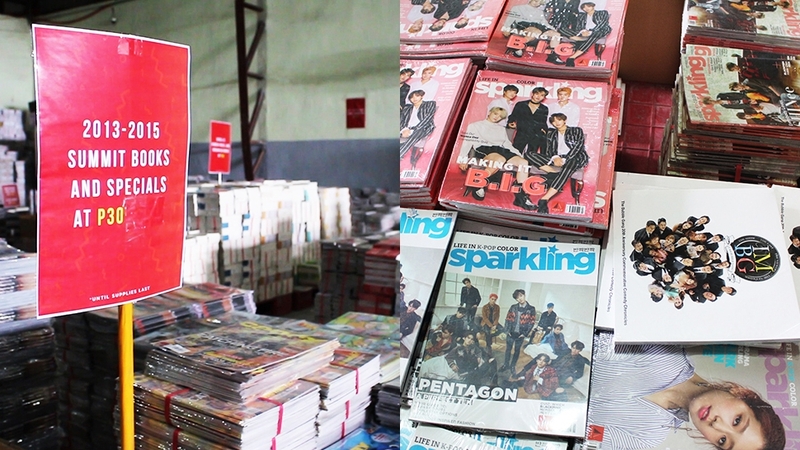 Bookworms and magazine collectors had a field day—or three—as they flocked to the first-ever Summit Media Warehouse Sale from January 18 to 20 at the Summit Media Warehouse, RDC Business Complex, Brgy. San Andres, Cainta, Rizal. The warehouse sale brought out Summit Media’s latest magazine issues as well as hard-to-find back issues, offering them at as low as P30 per copy and bundling them with free books. From copies of Summit’s existing print titles to those of well-loved yet now-defunct Summit magazines, readers feasted on massive stacks of discounted reads. Also for sale at as low as P30 per copy were releases from Summit Books and its imprints (Pop Fiction, Kimchi Press, Rawr Books, Berry Books, Dream Big Books, Majesty Press, and Made of Bricks). Readers nostalgic for Summit Media’s older chick lit catalog also got to take home favorites such as The Breakup Diaries by Maya O. Calica and the Vince’s Life series by Vince O. Teves. Notable bestsellers at the event were Jonaxx’s Heartless and Worthless under the Majesty Press imprint, while Pop Fiction books from 2013 to 2016 priced at only P100 per copy also flew off the stacks. Besides low prices and free books, customers were treated to freebies such as a free Pop Fiction sticker set for every single receipt purchase worth P500 and a free canvas drawstring bag designed by Abbey Sy, artist and bestselling author behind The ABCs of Hand Lettering, Letters from ABC: 52 Postcards from A to Z, and The ABCs of Journaling, for every single receipt purchase worth P1,000. Watch the video and see photos from the Summit Media Warehouse Sale below.